For today's blog post I decided to do days 2 and 3 of the Tanya Burr advent calender together, just for the fact of what was behind both doors and both were little beauty accessories. 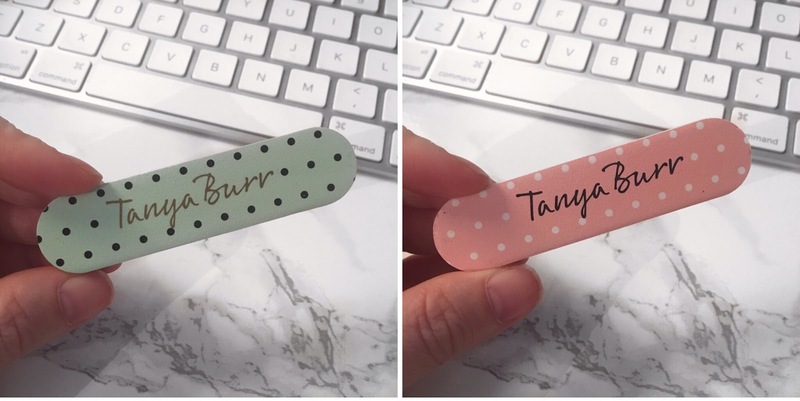 First up is this little mini nail file, on one side it's in a mint colour with black spots and "Tanya Burr" written on it, and on the other side it's pink with white spots again with "Tanya Burr" written on it. Being a nail technician I love any kind of nail files, especially miniature sized ones that are handy just to either pop into your bag, purse or even inside your coat pocket. As you never know when a nail file will come in handy, especially if you break a nail....and it has a sharp edge! Behind door number 3 was this miniature sized circle mirror in a sort of pale blue with "Tanya Burr Cosmetics" written in gold across the front of it. At first look I actually thought this was a badge haha, it wasn't until I turned it over to see the little circle mirror on the back of it. The next "Tanya burr" post will be of days 4+5, so that should be up either Monday night or Tuesday morning. It all depends on how quick I can get the pictures taken for it and get the blog post written up aswell.